If you saw our production, please drop us a line and let us know what you thought. Thanks! The finale from ReAct's A Chorus Line. Michael Miller performing "I Can Do That" as Mike in ReAct's A Chorus Line. Paul's accident scene in ReAct's A Chorus Line. Crystal Dawn Munkers performing "The Music & The Mirror" as Cassie in ReAct's A Chorus Line. Cassie in ReAct's A Chorus Line.
" -- The Best Musical. EVER." A moment from the golden finale of ReAct's A Chorus Line. ReAct's remount of A Chorus Line. was originally presented at the Newman Theatre, New York City, April 15, 1975 - July 13, 1975. The show then transferred to the Sam S. Shubert Theatre, New York City, on July 27, 1975 where it ran for 6137 performances. 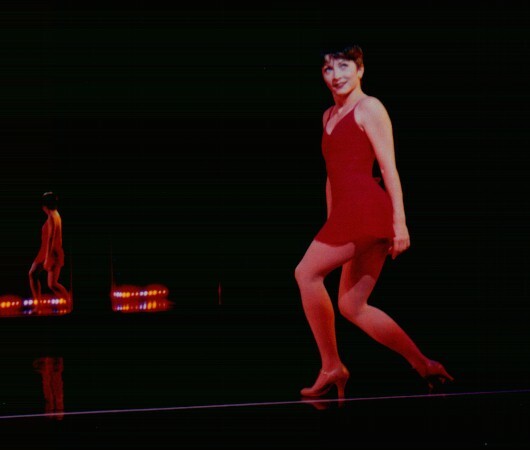 The characters portrayed in A Chorus Line are, for the most part, based upon the lives and experiences of Broadway dancers. This show is dedicated to anyone who has ever danced in a chorus or marched in step ...anywhere. When I first saw A Chorus Line on Broadway in the summer of 1982, I was dazzled by the show's choreography and intrigued by the show's premise: a group of Broadway dancers trying to achieve their dreams. Much of the show's appeal comes from the realization that these dreams are alive within ourselves. A Chorus Line is a show about dignity, the nobility with which each dancer stands on the line, waiting for a disembodied voice to decide their fate. This ultimate decision finds some of them losers and some winners, but in this process we get a glimpse of what it means to do something for love, just as each of the dancers have. The phenomenal success of the show can be traced directly to the original dancers and their stories upon which A Chorus Line was based. 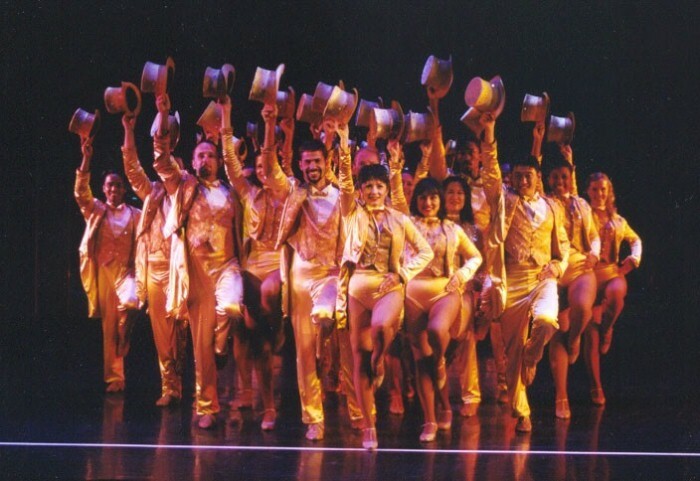 A Chorus Line is still one of the longest running dance musicals in Broadway history, playing for 6137 performances from July 25, 1975 through April 28th, 1990. It won nine Tony Awards including Best Musical, and is one of only a small handful of musicals that has also won the Pulitzer Prize for Drama. Our goal with this production was to re-create the look and feel of the original production of A Chorus Line which played at the Public Theatre in New York before it moved to the Shubert Theatre on Broadway. With lighting effects, set design, costumes and almost all of the original choreography of Michael Bennett, I hope we've come pretty close, with a few improvements along the way including some added cultural diversity in the casting. It has been a delight for myself and the cast and crew to stage this most challenging and acclaimed of musicals. This process has been an exciting and insightful journey for the company, and a dream come true for myself. Thanks to those who attended, I hope you enjoyed the show! >>A Chorus Line at the 1976 Tony Awards - "I Hope I Get It"
>>A Chorus Line at the 1976 Tony Awards - "One"
ReAct's presentation of A Chorus Line was produced by special arrangement, and the music and dialogue material furnished by TAMS-WITMARK MUSIC LIBRARY, INC., 560 Lexington Avenue, New York, NY 10022. The cast photo of ReAct's A Chorus Line. 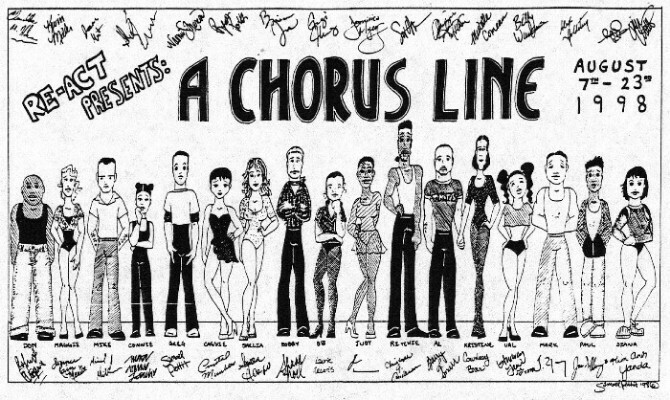 The official cast illustration of ReAct's A Chorus Line.